While Trade Up! is about personal change, it also provides guidance for leading organizational change. Sharpnack maintains that leaders are in the business of changing context and, as such, they must work to reveal and shift context in themselves and others. As we absorb the central empowering message of Trade Up! 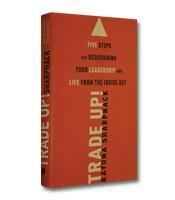 : Five Steps for Redesigning Your Leadership and Life From the Inside Out, it’s easy to recall the old children’s saying, “Sticks and stones will break my bones, but words will never harm me.” Whether talking about personal or professional development, we can almost hear author Rayona Sharpnack shouting her unequivocal disagreement. She builds a convincing case that language provides the essential context by which we perceive, translate and understand the world around us. As such, it becomes the rudder that allows us to steer free from the traditional limitations and “trade up” to reach a new, more authentic potential. “The nature of your thinking and how you articulate your dreams and goals to yourself and others has a major impact on your chances of success,” she asserts. “The game is played in the mind, first and foremost and language is the critical instrument.” If that sounds ambitious, it is. But Sharpnack provides a practical roadmap to create new opportunities in order to achieve lasting and meaningful results. The founder and CEO of the Institute for Women’s Leadership, Sharpnack offers a compelling argument for personal improvement, drawing on her own experiences as a schoolteacher, tennis champion, professional softball player and manager and a coach of several successful, if unheralded, business leaders. In fact, she introduces us to many of her clients who have achieved impressive results while restoring meaning to their lives. As such, her insights are illuminating, relevant and, at times, painfully close to home. Yet still, work needs to be done. The painful emergence from the cocoon forces fluid through the butterfly’s wings allowing it to take flight. Efforts to help the butterfly by accelerating the process and pulling its wings straight actually lead to permanent damage. “Individuals and organizations experiencing profound change go through a similar sense of formlessness and helplessness for a time, followed by a period of uncertainty in which new skills and habits need to be allowed to set before they take flight,” she advises. Taking charge of our own lives to create the authentic context and future we desire must be combined with action, practice and behaviors that help lock the new profile into our personal DNA. Thus equipped, we can gradually broaden our sphere of influence. While Trade Up! is about personal change, it also provides guidance for leading organizational change. Sharpnack maintains that leaders are in the business of changing context and, as such, they must work to reveal and shift context in themselves and others. Once they discover who they are and the preconceived ideas that constitute their reality at its most basic levels, they can trade up to become the authentic person they need to be in order to make the world better.